Then, as the twentieth century progressed and doctors and scientists began to point an accusing finger at artery-clogging animal fats, pork producers responded by raising leaner hogs. New breeds, feeds, and practices turned out pork that was not only lower in fat, but almost entirely free from the curse–if not the stigma–of trichinosis. Pork is now more than 30 percent leaner than it was just 20 years ago; fewer than a dozen cases of trichinosis are seen each year and most of those come from wild pigs. But this leaner, whiter meat, combined with home cooks’ vestigial practice of cooking long enough to kill trichinosis, has resulted in many disappointing dinners; today’s average pork is tough, dry, overcooked and has little of the appeal it had only a few generations ago. To address the problem of dry, flavorless pork, producers have introduced what is known as “enhanced pork.” By injecting meat with a solution of water, salt, and sodium phosphates, they are doing on a large scale what many of us do at home: brining. But whereas we might brine a loin roast or a turkey with salt, sugar, spices and water, hoping to keep a lean piece of meat moist and flavorful, meat companies go a couple of steps further, adding things like potassium lactate or sodium citrate to increase shelf life and sodium diacetate as a “flavor protectant.” Some enhanced products are also flavored and clearly labeled as such, as in a teriyaki-flavored pork loin. But more commonly, the labels use more subtle terms like “premium pork,” “tender and juicy” or “deep basted.” In fine print you’ll see the solution ingredients. These are the packages to watch out for. None of these enhancing solution ingredients should necessarily give you cause for alarm; sodium citrate, for example, is commonly found in ice creams and soft drinks. And enhanced pork really does achieve its primary goal of making the average piece of pork more tender, juicy and flavorful to the average consumer. It also helps counteract the tendency of the average person to overcook pork. But do you consider yourself an “average” cook or an “average” consumer? We didn’t think so. For those of us interested in grilling, smoking, and roasting pork, enhanced meat just doesn’t cut it. For one thing, it’s more expensive; while the price per pound may be the same or even less than regular pork, you’re getting less meat and more water and salt per pound. And secondly, if you’re planning on using a marinade, rub, or sauce, you run a very serious risk of serving way-too-salty meat. So what can a serious cook do to start a pork project with the highest quality piece of meat? Thankfully, a convergence of trends is now engendering a pork renaissance. Major grocery store chains like Whole Foods and Wild Oats only sell natural, un-enhanced, antibiotic-free pork at their meat counters. Niman Ranch, a coalition of small family farmers, sells natural pork at an increasing number of grocery stores, including Trader Joe’s. And more and more producers are raising fatter, more flavorful hogs. Those of you who love pork more than life itself will be interested in what the National Pork Board calls “Niche Pork.” According to Iowa State University, between 1980 and 2002, the number of pig farms in Iowa (the nation’s pork capital) dropped from 65,000 to fewer than 10,000. Meanwhile, the size of the average farm grew from about 200 hogs to 1,400. Big factory farms have made it all but impossible for small farms to make money selling hogs unless they can somehow differentiate their product. Hence: niche pork. Niche pork products are all special in one way or another. Farmers may limit themselves to raising certain special breeds of pigs, the way they might grow heirloom tomato varieties. 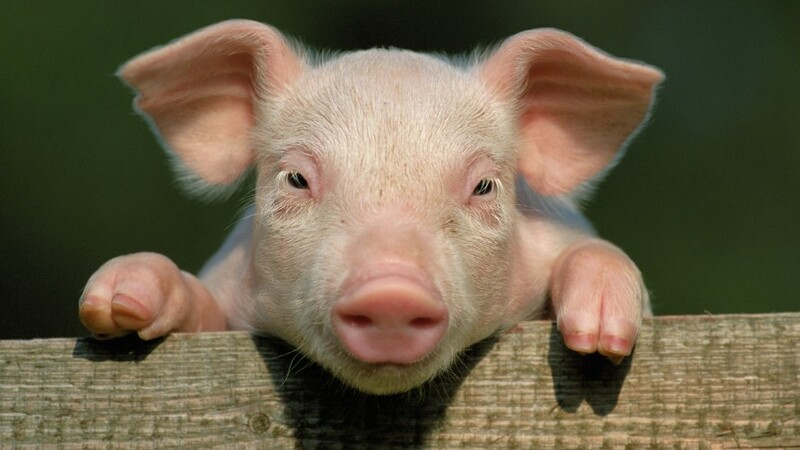 Pigs are not native to the United States, having been brought here by Columbus and other Spanish explorers. 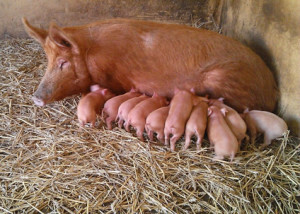 Today, most pork comes from crosses of Duroc, Yorkshire, and Hampshire, the latter two being chosen for qualities like hardiness, vigor and ability to produce big litters. But some farmers are starting to market old-fashioned, richly marbled and highly flavorful breeds like Berkshire and Tamworth. So while the giants of the pork industry address the problem of dry, tough pork with enhanced products, small farmers do it by raising fatter hogs. In January, 2004, the Wall Street Journal reported that although heritage breed pork represents less than one-tenth of one percent of hogs in this country, it is one niche that’s growing quickly. Eden Farms, an Iowa producer of Berkshire pork saw their sales triple from 2001 to 2004, according the Journal. The downside of heritage breeds like Berkshire is that because there are so few farmers raising them, the meat tends to be very expensive. For most of us, that means it’s out of our price range for every day meals, but might be an option for special occasions. Part of the reason prices are so high is that few retailers offer heritage breed pork; having it shipped is possible, but can double the cost. Web sites like Heritage Farms sell not only Berkshire meat, but cuts from Tamworth and Gloucestershire Old Spots too. Snake River Farms is the country’s largest purveyor of Berkshire meat . Another good source for Berkshire pork is Minnesota’s Prairie Pride Farm. The least expensive way to buy heritage meat is to find a producer near you. The National Pork Board has a web site, www.nichepork.com, that allows you to search for producers in your area. Many of them allow you to buy quarter- and half-hogs directly from the farm, thereby bringing the cost down significantly. Choosing the right cooking method is vital to getting the most out of each cut of pork. 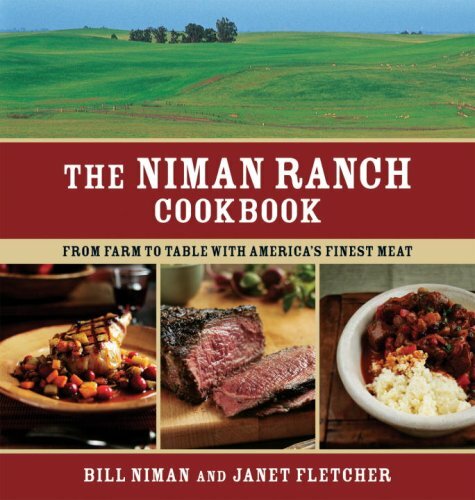 The newly published Niman Ranch Cookbook (Ten Speed Press, hardcover, $35) has loads of information on pork and some delicious fiery recipes. 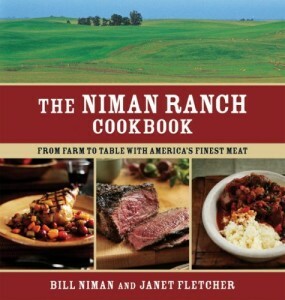 Authors Bill Niman and Janet Fletcher advise that cuts from the loin and leg should be cooked to an internal temperature no higher than 150 degrees F. Trichinosis is eliminated at 137 degrees F, so taking your meat off the heat at 140 degrees F is a good general guide; the internal temperature will continue to rise 5 to 10 degrees as it rests. The cuts we often use for grilling and smoking, like ribs, benefit from long, slow cooking and don’t get tender until well done, 160 degrees F and above. If you decide to spend money on niche pork for a special dinner party, consider buying a loin roast. You’ll notice the marbling in the flesh and should be able to have the butcher leave a thick piece of fat on the surface. For a big crowd, try a leg of pork, also known as fresh ham. One is enough to feed a crowd and the flavor is outstanding. For everyday eating, try to search out pork that is antibiotic-free and not enhanced. Ask your butcher for details about the meat he stocks. 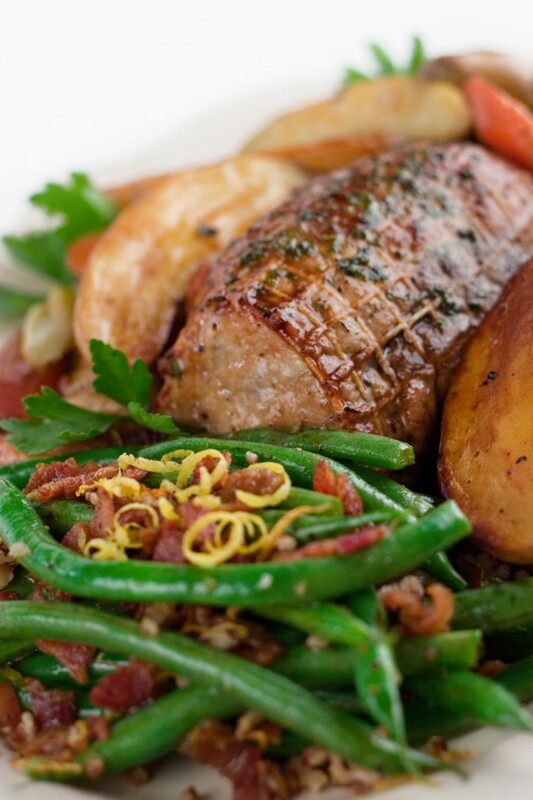 Conventional pork that’s not enhanced will often benefit from brining at home. The farmers who sell their hogs to Niman Ranch raise animals bred for flavor and a layer of backfat thick enough to keep them warm throughout the winter–they’re all raised outdoors, not in heated buildings. So if you buy Niman Ranch meat, or meat from farmers who use similar methods, you’ll find it’s ready for whatever you want to do with it. This recipe is from Steve Ells, founder of Chipotle Mexican Grill. Pat the pork dry with a paper towel and season it with salt and pepper. Let it sit at room temperature for 1 hour. Put the chipotles, bay leaves and cloves in the center of a cheesecloth square, gather the ends and secure with kitchen twine. Set aside. Heat 1 tablespoon of the olive oil in a Dutch oven over medium-high heat. Add the pork and cook, turning as needed, for about 3 minutes per side, or until evenly browned. Transfer to a plate. Discard any excess oil from the pan. Add the remaining 1 tablespoon oil and heat over low heat. Add the onion, then cover and cook, stirring occasionally, for about 10 minutes, or until translucent. Add the garlic and cook, uncovered, for 1 minutes. Stir in the stock, tomatoes and cumin. Add the pork and spice bundle. Increase the heat to medium-high and bring to a boil. Remove from the heat. Cover and place in the oven. Bake, turning one or twice, for about 3 hours, or until the meat is fork tender. Transfer the pork to a cutting board. Skim away any fat from the top of the sauce and discard. Add the oregano and cinnamon and bring to a boil over medium-high heat. Cook for 10 to 15 minutes until the liquid is reduced and begins to thicken. Remove and discard the spice bundle. Season to taste with salt and pepper. Cut the pork across the grain into thin slices and add to the sauce. Spoon the sauce gently over the meat before serving. This recipe comes from Gary Fuller’s Laurier Cafe and Wine in Houston, Texas. Fuller recommends you serve it with cumin-spiced black beans and rice. Trim the tenderloins of any excess fat and silver skin. Set in a small nonreactive baking dish. Combine the orange juice, lemon juice, garlic, shallots and chiles in a small bowl and stir well. Pour over the tenderloins and let sit for 20 minutes at room temperature. Heat the olive oil in a large, ovenproof skillet over medium-high heat. Remove the tenderloins from the marinade, reserving the marinade. Wipe the meat dry with a paper towel and season with salt and pepper. Add to the skillet and cook, turning as needed, for 4 to 5 minutes, until evenly browned. Transfer to the oven and roast for 12 to 15 minutes, until an instant-read thermometer inserted into the center reads 140 degrees F. Transfer the meat to a plate and cover loosely with aluminum foil to keep warm. Pour the marinade into the skillet and add the chicken stock. Bring to a boil over high heat and cook for 8 to 10 minutes, until reduced and thickened. Pour through a fine-mesh sieve into a bowl. Cut the tenderloins across the grain into thin slices and arrange on a platter. Drizzle the sauce over the top and sprinkle with the cilantro before serving. This recipe comes from Peter Hoffman of Savoy restaurant in New York City. Put the shoulder and bones in a stockpot and add the water. Bring to a boil over high heat. Reduce the heat to medium-low and simmer, uncovered, skimming away any foam that rises to the top, for about 3 hours or until the meat is tender. Remove from the heat and let the meat cool in the broth for about 30 minutes. Spread the pumpkin seeds on a baking sheet. Place in the oven and toast for 5 to 7 minutes, or until aromatic. Let cool. Using tongs, transfer the meat to a plate. Skim away and discard any fat collected on the top of the broth. Heat a large skillet over medium-high heat. Add the tomatillos and cook, turning and rolling with tongs, for about 5 minutes, or until the skins begin to blacken and blister. Transfer to a blender. Add the chiles to the skillet and cook, turning as needed, for 1 to 2 minutes, until the skins begin to blacken and blister. Transfer to the blender. Set the skillet aside. Add 1 cup of the broth from the stockpot to the blender and blend until the tomatillos and chiles are finely chopped. Add the onion and blend until almost pureed. Heat the bacon drippings in the skillet over medium-high heat. Carefully pour the tomatillo puree into the skillet, watching for splatters. Cook for about 10 minutes, or until the puree begins to turn brown and dry slightly. Add to the meat broth. Stir in the hominy, garlic, oregano and 1 tablespoon salt. Shred the meat and add to the vegetables. Cook over low heat for about 30 minutes, or until the flavors have melded. Season to taste with salt and pepper. To prepare the condiments, put the onion, avocado, limes, radishes and cabbage in separate small bowls. Serve the stew with the condiments.